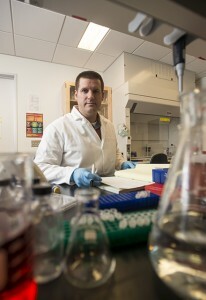 Jonathan Kelber in his lab. A recent study by a team at California State University, Northridge, led by biologist Jonathan Kelber, offers insight into the role certain proteins play in stem cell-mediated tissue regeneration, which could have implications for how clinicians treat health problems associated with wound healing such as diabetes and other degenerative diseases. The team — including seven CSUN students and colleagues at The Salk Institute for Biological Studies in La Jolla, Calif., — has found that a certain motor protein inside stem cells, known as non-muscle myosin II, determines where and how the cell-surface protein Cripto functions to promote stem cell proliferation and tissue regeneration. Kelber noted that there are a number of diseases, such as diabetes and forms of fibrosis (abnormal scarring in tissue) that cause injuries which are hard for the human body to naturally heal. The study, “Identification of myosin II as a Cripto binding protein and regulator of Cripto function in stem cells and tissue regeneration,” was published last month in the journal Biochemical and Biophysical Research Communications. In addition to Kelber, the research team included CSUN graduate and undergraduate students Farhana Runa; Erika Duell, an NIH BUILD PODER scholar; Blake Williams; Caroline Arellano-Garcia, a NIH MARC scholar; Toni Uhlendorf; and Sa La Kim, a NIH MARC scholar; and Malachia Hoover, a National Institutes of Health (NIH) RISE scholar who is now a doctoral student at Stanford University. Also part of the project are Evan Booker, Wolfgang Fischer and Peter Gray with the Clayton Foundation for Peptide Biology at The Salk Institute and Jolene K. Diedriech and James Moresco with the Mass Spectrometry Core at The Salk Institute. First author Hoover, now in her second year at the Stanford Graduate Program in Stem Cell Biology & Regenerative Medicine, gained interest in this project during her first year as a master’s graduate student in Kelber’s Developmental Oncogene Laboratory, when she learned that Kelber’s collaborators at The Salk Institute had discovered a novel interaction between Cripto and the non-muscle myosin II motor proteins. She was keen to know whether this interaction could regulate some of Cripto’s well-known functions and if so, how. “This will help researchers develop new strategies for diagnosis and treatment of diseases,” Runa said. Prior studies have demonstrated the important roles that myosin II proteins — MYH9 and MYH10 — play in cytoskeleton regulation and intracelluar transport of cargo, regulating cell secretion and a cell’s ability to move. Earlier work by Kelber and others has also demonstrated the important role Cripto, which is tethered to the outside of the cell membrane, plays in stem and cancer cell biology. Kelber said the first part of the study details how the team identified novel Cripto-interacting proteins (termed the “Cripto interactome”), and how they discovered that MYH9/10 were part of this network. The researchers set out to see if myosin II could regulate Cripto expression and where Cripto localizes within the cell. The researchers then tested the function of this biochemical interaction in stem cells in vitro and in the zebrafish caudal fin wound healing in vivo model. Some of the earliest phenotypes of Cripto function were characterized during zebrafish embryogenesis — the ortholog of Cripto in zebrafish is known as one-eyed pinhead (oep) due to the striking cyclops phenotypes observed when Cripto function is disrupted during normal development. The researchers also treated the fish with a myosin II inhibitor and found myosin II proteins were important for regeneration in the same way as Cripto. When they inhibited Cripto and myosin II at the same time, no additional inhibition of tissue regeneration was observed. In biological research, this usually indicates that the genes/proteins/pathways being inhibited function in a cooperative or overlapping manner. Kelber said their discoveries are important as researchers move forward in understanding how certain diseases inhibit natural wound healing in the body. “We hope that our current and future studies will pave the way to help find new solutions to currently unsolved biomedical issues,” Kelber said.